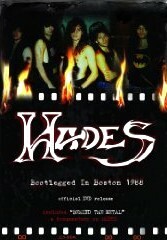 with Inside The Metal you get a 45 minutes long documentary of Hades with interviews and live sequences. Some interview parts are just snippets, then you see some photos taken at different stages of their career and hear some one telling the story of Hades - I guess it's Dan Lorenzo, but due to the varying sound quality of the interview snippets, one can't be sure. Beside that everybody get the chance to speak up. You also get some blurry, shaking video sequences of Non-Fiction live and video clip you might have seen on MTV... The documentary was done around the year 2000 / 2001, I guess, but I have no information about it. Sorry. As a bonus you et a video clip which was done much later by Dan Lorenzo and his mates. Its a heavy mid-paced rocker, but I confess I don't know the song. At least it has a good audio and image quality. The US band Hades was founded back in 1978 and released their first demos in the early 80's. Their debut album Resisting Success was released in 1987, they released 2 more studio albums and a live album meanwhile. Now Dan Lorenzo and his mates are back with $aviour$elf. The opening track is also the title track and leads you into the album with slowly, but then they explode and offer a powerful thrash tune. Fast double bass drumming by Dave Lescinsky forces them ahead. Alan Tecchio partly sounds pleading, but still powerful. A solo part by lead guitarist Ed Fuhrman gives you a short break - before they storm off again. Hades present a version of US Metal with some thrashy parts. At Decline & Fall Of The American Empire they use a spoken word part which seems to be taken off a broadcast - and that fits very well. They change speed during the songs and so make it more interesting for the listener. Our Father is a ecclesiastical vocal piece which leads into Active Contrition, mid-paced tune with heavy riffs. On top of the heavy riffs the powerful, high voice of Alan Tecchio is dragging you into Hades. The song fades out with some church choir... but like you listen to an old tape which slowly stops. The following To Know One got me right away with its guitar work, starting slowly.... Then they add some power, but return to the basic part. A song which will haunt you, but not because it's overly catchy! Not a typical Hades tune, but very cool! The Agnostic is an instrumental interlude and leads over to Y 2 K. With the different vocal styles the tune partly make me think of Mercyful Fate, even if Tecchio is showing a larger variety - incl. some growls! And musically the song differs, is more a US metal tune... Towards the end the offer a semi-acoustic ballad with Fall. Another facet of Hades. 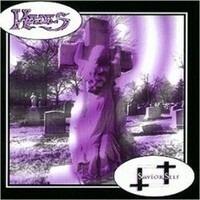 This Hades album is interesting for fans of US metal and power metal which like a dash of thrash in their music. But with singer Alan Tecchio they have an extraordinary singer in the band and it's simply fun to listen. They offer a blend of sounds and every song is different, but still the album is homogenous. My only complain is that the album is quite short with less then 37 minutes! Beside that... well done!